As a website owner, you are best suited to make judgment calls regarding any business decisions. The onus is on you to make the necessary adjustments to your website at any time of the day. With the latest browser operated application, Content Management System (CMS), you no longer need to rely on technical assistance. Whether you wish to update product listings, changing prices, updating news and events or enhancing webpage aesthetics, CMS is the perfect solution. As a CMS development company based in India, 21 Century Web is clearly aware that time is of the essence. We understand that the latest information drives the economy and success can be determined within a split second. Therefore, our integrated content management system allows you to have full control over the content of your website. You have the ability to make changes to your website based on current market conditions. In addition to integrating CMS, 21 Century Web also provides extensive technical coverage such as consulting services, troubleshooting and web based or desktop problem solving. 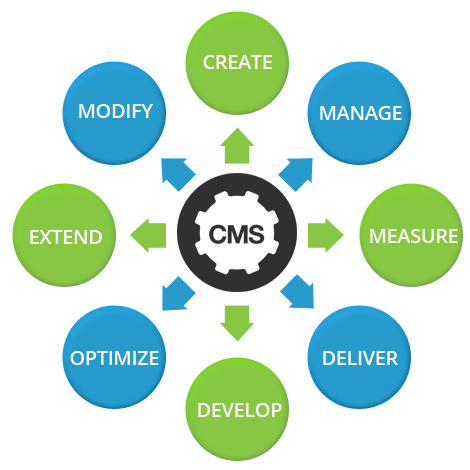 Our reputable expertise in CMS development comprises of services such as theme development, module development, support and maintenance, technical enhancement and other new developments. By trusting 21 Century Web with your CMS issues, you are able to fully commit your resources towards the business. Start taking control of your website with the latest open source Content Management System now.